This week, the U.S. Navy conducted the Trump administration’s fourth freedom of navigation operation (FONOP) in the South China Sea, while the United Kingdom seemingly reversed its policy on such operations. On October, the USS Chafee conducted a FONOP near the Paracel Islands in the South China Sea. The guided-missile destroyer reportedly came within 16 nautical miles of the Paracels, which have been controlled by China since 1974. 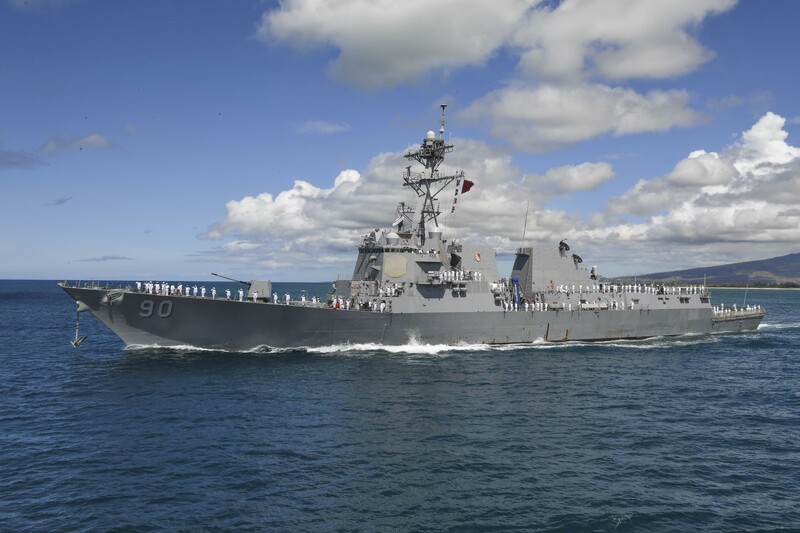 The USS Chafee notably did not pass the 12 nautical mile threshold that would delineate territorial waters under the United Nation Convention on the Law of the Sea. U.S. naval vessels conducting FONOPs generally sail within 12 nautical miles of the disputed island to indicate that the United States does not recognize the territorial claims. Pentagon officials did not comment on the specific operation but reiterated that the United States carries out regular FONOPs and will continue to do so. This pronouncement seems to reverse the U.K. government’s position from July, when Foreign Secretary Boris Johnson stated that the Royal Navy would deploy its two new aircraft carriers to soon conduct FONOPs in the South China Sea. At the time, Defense Secretary Fallon himself confirmed that Britain planned to send a naval vessel to the South China Sea to conduct a FONOP. Earlier this month, the Armed Forces of the Philippines and the Philippine National Police received a donation from China of three thousand M4 rifles, three million rounds of ammunitions and 90 sniper scopes. At the donation ceremony, the Chinese ambassador to the Philippines, Zhao Jianhua, avowed that China is “committed to friendly and cooperative relations with the Philippines.” Ambassador Zhao pointed to the donation of arms, ammunitions, and accessories as “another demonstration of China’s commitment” to maintaining these relations. At the same event, Ambassador Zhao sought to reassure the Philippine public about the presence of Chinese ships in the South China Sea. Noting that it was “quite natural” for Chinese ships to be in disputed waters, because the countries shared overlapping claims, Zhao also stated that China had no intention of settling maritime disputes with the Philippines by force. Two Australian naval vessels arrived in Manila on Tuesday for a good will visit. The HMAS Adelaide, a landing helicopter dock, and the HMAS Darwin, a guided missile frigate, were greeted by Australian Ambassador to the Philippines Amanda Gorley and Philippine naval officials. Later in the day, Philippine President Rodrigo Duterte toured the Adelaide and thanked Ambassador Gorley, the Australian officers and the crew. This week’s commentary focused on U.S. and Japanese strategy regarding the Senkaku Islands. Tetsuo Kotani, executive director and secretary-general of the Japan Institute of International Affairs, penned an op-ed in the Japan Times calling on President Trump to visit Okinawa during next month’s visit to Japan. Comparing Okinawa to the DMZ, Kotani argues that President Trump should visit “the frontlines” of the East China Sea maritime disputes in order to emphasize that the United States protects the Senkaku Islands under the U.S.-Japan security treaty. The op-ed notes that Adm. Harry Harris, commander of U.S. Pacific Command, made a similar visit in May when he visited Yonaguni Island, which is just 80 nautical miles from the Senkaku island chain. Meanwhile, Grant Newsham of the Japan Forum for Strategic Studies outlines a plan in the Asia Times for Japan to defend its islands from China. In response to the steadily escalation of military activity near disputed islands in the East China Sea, Newsham calls for regular and frequent air and naval patrols and exercises with American forces in the areas surrounding the Ryukyu Islands, Japan’s southern chain of islands stretching into the East China Sea. Newsham further calls on Japan and the United States to end “decades of timid behavior” that have “put [the Senkaku Islands] at risk” by using two maritime firing ranges near the islands that have been dormant since the Carter administration. Eliot Kim is a JD candidate at Harvard Law School. Prior to law school he spent three years living in mainland China, including a year studying international relations at the Hopkins-Nanjing Center. Eliot is currently a member of Harvard's International Commercial Arbitration Moot Court Team and has previously been a research intern at the Congressional-Executive Commission on China.